Eric Hernandez is a native of Detroit, Michigan. He graduated from the University of Michigan, where he earned a B.S. in chemical engineering. In addition to his studies, Eric is actively focused in easing the difficult social and academic transitions of students to college life, which many underrepresented minority students must tackle. As an undergraduate, Eric served many leadership capacities, including a role as student coordinator with the Office of Undergraduate Admissions. In this capacity, he provided campus networking and analytical data support for underrepresented minority student recruitment efforts. 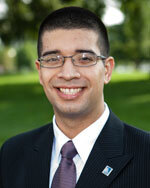 He also organized the student-driven first-year mentorship program, Assisting Latinos to Maximize Achievement (ALMA). Eric is interested in understanding municipal responsibility and the influence of community-based organizations in times of drastic economic change – specifically in urban areas. As a CHCI Public Policy Fellow, Eric looks forward to gaining a multidimensional understanding of policy-making as it relates to the development of urban and metropolitan areas.